You can next see the Storm in action against the Fife Flyers, Sunday 13th January, 17:30PM. Tickets can be ordered online HERE, by calling the Box Office on 0161 926 8782, or in person at the Box Office. There isn’t long until your Go Goodwins Manchester Storm face Patton Conference rivals, Guildford Flames. Join us on Wednesday 16th January for a 19:30PM face-off. This game will be televised live via Freesports, so bring the noise and let’s pack the Storm Shelter! NOTTINGHAM PANTHERS – SATURDAY 12TH JANUARY, 19:00PM FACE-OFF, THE MOTORPOINT ARENA. On Thursday GB head coach, Pete Russell announced the 26 person squad for their exhibition game against visitors, Dinamo Riga. Panthers defenceman, Tim Billingsley has been selected for the first time. The Panthers and Storm faced each other only six days ago. It was an exciting game, with a total of 70 shots on goal and goals from Long, Poulin, Springer and captain Dane Byers. The game went into overtime, the scoreline tied at 3-3. The Storm drew a penalty shot. It was Byers who took the winning shot, putting it past Garnett and securing the two points on home ice. 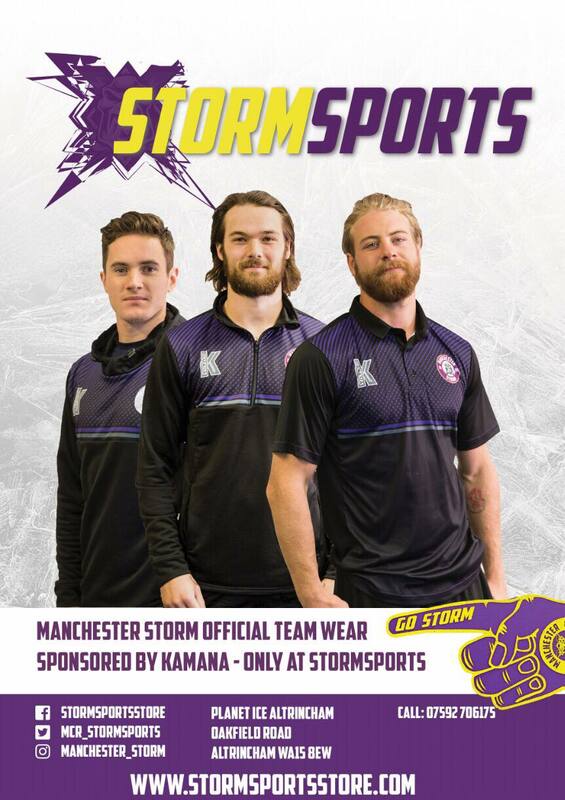 The Storm boys travel over to Nottingham to face the Panthers again and look to take two points on the road. FIFE FLYERS – SUNDAY 13TH JANUARY, 17:30PM FACE-OFF, PLANET ICE ALTRINCHAM. Fife Flyers are visitors to the Storm Shelter this weekend, following on from an away game against MK Lightning. The team are without defenceman Rick Pinkston, who despite skating with the team at training, is still sidelined with injury. The Flyers will also be without Buesa, Smith and Cochrane this weekend, as they compete in World Championship Division II Group A in Estonia until Saturday 19th January. Flyers forwards, Chase Schaber and Evan Bloodoff were both out with injury but were announced back on the lineup on New Years Day. Last time the Flyers visited in December, it was an extremely close game. Both teams went into overtime, Storm narrowly missing out on the win when Crowder scored the winning goal for Flyers, just a few minutes into overtime. Prior to that, Storm visited Fife Arena in November. Despite Storm pushing forward, with 35 shots on goal and a goalless third period, final result was 3-2 in favour of Fife. Expect a closely matched game between both teams this weekend, as Storm look to continue their streak at home and claim two points. Join us on Wednesday 16th January, as the Storm face Patton Conference rivals – Guildford Flames. Bring your friends, bring the noise and let’s pack the shelter, as this game is going to be televised live on Freesports. Face-off is 19:30PM, we look forward to seeing you there! The OSC have just announced their next event, Storm Bingo – January 22nd, 7:00PM. Email [email protected] for more information! You can find further information on their special events on their social media. Book soon to avoid disappointment!